PPC is always custom but below are the most common packages, which apply to startups and to established businesses. We can start with any of these as applicable and scale it as per your goals. Our Google Ads Custom PPC Packages are designed specially to deliver the best performance. Explore our pricing below or ask us for a custom quote. Google Ads (Previously known as Google Adwords) is one of the m highly result oriented online advertising platforms. It can get you the best results in comparison to any other conventional advertising platforms, if managed properly. Our Adwords Management specialists will discuss your requirement first, create a base campaign overview, and initial analysis report which includes current campaign status(if already running ads), website/product/services analysis, competition analysis, marketing and target analysis and work plan. We set our goals, tracking and milestones to make sure we achieve expected results in a timely manner. Although overall conversion depends on multiple factors (i.e. target demographics, budget, product, pricing, demand, season etc) we make sure you get the best results, highest conversions at least cost possible. - What is Google Ads PPC Management? Google Ads or Google Adwords(Previously known as) is Advertising solution offered by google which enables advertisers to run ads on Google Search, Google’s Search Network, Display Network (of millions of website publishing google ads), youtube and your existing customer base/marketing and previous website visitors. It has over 90% of overall advertising share, thus making it the largest online ad platform. - Can I customize these Google PPC Management Packages. Yes, As every business is different, its needs are different. Hence we offer custom Google ppc management solution. Contact us here for pricing. - Do these packages cover everything I need for my campaign? Yes almost everything a business type needs. But yes as per budget or custom targeting, it may need further customization. We do offer that at custom pricing. We also offer ad on services which are not included in the standard packages but regularly ordered are Landing Page Design, Google Ad Design, Video Creation etc. - What is the success rate? It depends on business to business and lots more factors like (your budget, target market, current competition, your offerings, your website presence, landing page and a lot more). Over 95% of customer who joins us are happy with the performance. Over the top we offer no long-term contract bound so it is equal to continue on performance basis – you try one month or do not continue. It is that simple. - Can I resell these packages? Yes, we offer 100% white label ppc management program. It means you can resell the packages at your own pricing markup (100-200% or more) and we will fulfil on your behalf and each reports will include your branding. We will also provide white label support in case if you do not have any ppc knowledge. 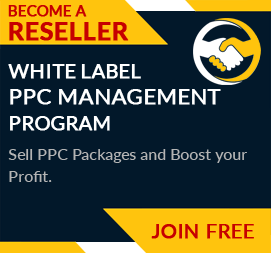 With our PPC Reseller program you can sell the services, like a pro. Sign Up here. - Do you offer Agency or Bulk Account Transfer and Discount? Yes, we love bulk orders and agencies with large accounts. We offer good discount based on volume. Please contact us here for more details. PPCPapa’s deep insight into PPC management has helped my business secure a good position online. The team is diligent and holds experience in the work they do.